√ Moving to the Canary Islands? √ Leaving the Islands to relocate anywhere Worldwide? √ Planning to move within the Canary Islands? At Worldwide Moving we understand moving can be a stressful time, let us do the hard work and take away all of the worry. From a few boxes of personal effects to a private use container, you are assured of a high standard & professional service from a dedicated team. We care about your valuable possessions and take every measure to protect them. Worldwide Moving offers the Utmost care and attention for your most treasured items like your grandmother´s china, antiques, pianos and even your beloved pets. Our service is tailored to fit around your wishes, with a personal service offered in many languages. 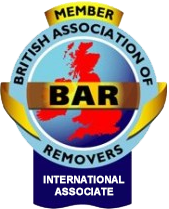 Worldwide Moving is an international associate member of the BRITISH ASSOCIATION OF REMOVERS and have been trading from our offices in Tenerife since 1985. We´ve been moving families around the world for over 30 years! We understand that your personal effects are important to you, and we take every measure possible to keep them safe and undamaged. Our storage facilities in Tenerife provide the perfect solution for keeping hold of your prized possessions under changing circumstances. Find out more about what our customers have to say about us by reading through our collection of reviews and testimonials.